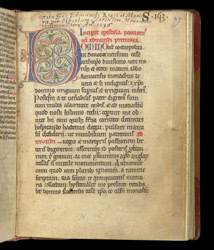 Within this manuscript the authorship of the text is attributed to Osbert of Clare, a monk of Westminster abbey, who died sometime after 1139. Among his other works are biographies of other saints and some sermons; he was also the forger of a series of charters for Westminster and other abbeys. St. Edmund was martyred by Viking invaders in 869, and buried in a shrine at Bury St. Edmunds; this manuscript contains comes from the library there. This is the first page of the text introductory epistle which precedes the main text; in which Edmund's name is written in red. In the upper right-hand corner is the Bury St. Edmunds library shelfmark: 'S .153. '; an 11th-century 'Life of St. Edmund', also from Bury, has the shelfmark 'S .155.' (The 'S' stands for a Latin word meaning 'Saint').